Ephemeris for Friday, July 14th. Today the Sun will be up for 15 hours and 14 minutes, setting at 9:25, and it will rise tomorrow at 6:11. The Moon, 2 days before last quarter, will rise at 12:32 tomorrow morning. Fairly high in the east at 11 p.m. Is the constellation of Cygnus the swan, flying south through the Milky Way. It is also called the Northern Cross. At the left, the tail of the swan or the head of the cross is the bright star Deneb, one of the stars of the Summer Triangle. The next star right is Sadr the intersection of the body and the wings of the swan seen in flight, or the intersection of the two pieces of the cross. There are two or three stars farther to the right that delineate the swan’s long neck or upright of the cross, that ends with the star Alberio in the beak of the swan or foot of the cross. The crosspiece of the cross extends to the stars on either side of the intersection star Sadr, while the swan’s wings extend to a couple more stars each. 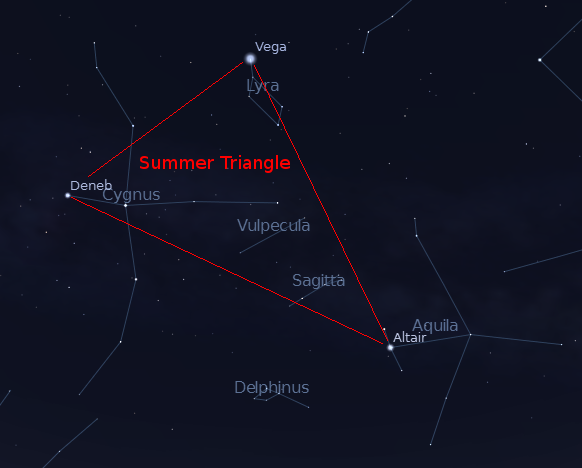 The Summer Triangle. Created using Stellarium and The Gimp. Animated Cygnus finder chart. Created using Stellarium. In mythology Cygnus was the form Zeus took in the Leda and the swan affair. 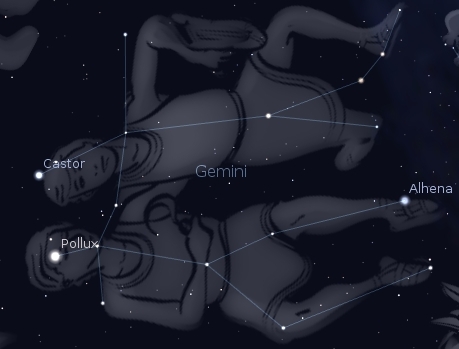 Out of that union was born Pollux of Gemini fame. His half-brother and twin Castor was fathered by a mere mortal. Go here for their story. Alberio is the star that shows in Cygnus’ eye. In telescopes of even low power Alberio shows as a binary star whose components are distinctly and beautiful blue and gold. Binoculars are not quite powerful enough to split these two.